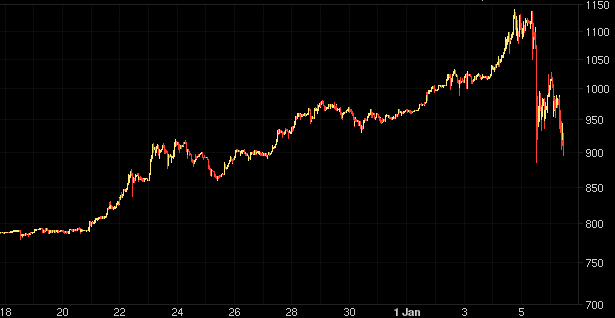 During the last hours bitcoin crashed more than 20% shortly before making a new all-time high against the dollar. The vehement move suggests that the recent rally was driven by short-term oriented traders and not by long-term investors who anticipated a new bull run after clearing the all-time high. Overall, that is a less bullish sign for the real bitcoin saga. Long-term investo-traders or even buy-and-hold investors don’t seem to be the driving force in the current environment, at current price levels after such a long upmove, or without being able to trade bitcoin via an ETF. Perhaps this changes when the ETF finally arrives or prices stabilize near the all-time high, form a base, and a real breakout can occur. But traders are already positioning themselves ahead of this event by buying bitcoin CFDs. Bitcoin can be traded at various “exchanges”, but that are merely online companies calling themselves an exchange without actually being a regulated exchange. The solution for now is to trade or buy the bitcoin CFD. And the best thing is, one can trade many other different markets via CFDs like oil, gold, or stocks all from one single account.